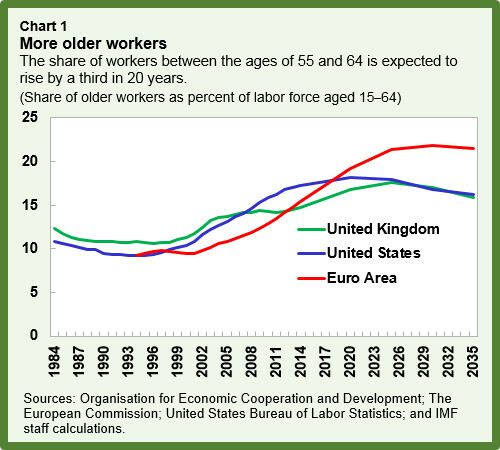 In parallel to the aging of the general population, the workforce in the euro area is also growing older. This could cause productivity growth to decline in the years ahead, raising another policy challenge for governments already dealing with legacies from the crisis such as high unemployment and debt. The euro area’s population is expected to grow significantly older over the next couple of decades. This has two components. First, the number of retirees is set to grow compared to the people of working age (15–64) in the region. Second, and much less examined, the average age of people within the labor force will rise: the share of workers aged 55–64 is forecast to increase by a third, from 15 percent to 20 percent, over the next two decades (Chart 1). What is the likely impact of such workforce aging? If different age cohorts within the workforce have different levels of productivity, then clearly average productivity will be affected by changes in the age distribution. But in which direction? 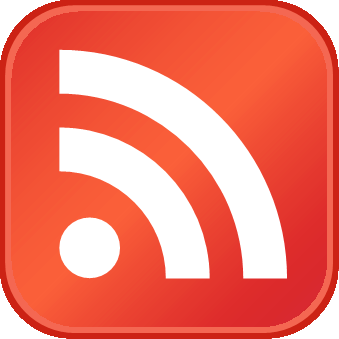 There are several different theories regarding age-related effects on productivity. On the one hand, accumulated years of work experience could make older workers more productive. On the other hand, frailer health and obsolete skills could reduce their productivity, at least beyond a certain threshold. While it is difficult to generalize across occupations, the consensus in the literature is that productivity increases with age at first, peaking sometime in the 40s or 50s. Then it diminishes. We use a sample of European countries from 1950 to 2014 to examine the relationship between workforce aging and labor productivity. Correcting for various econometric pitfalls—such as reverse causality—we find that workforce aging significantly reduces output per worker. A five percentage point increase in the share of workers aged 55–64 is associated with a decrease in labor productivity of about three percent. Changes in labor productivity—that is, output per worker—can themselves be broken down into changes in the amount of physical and human capital used, and total factor productivity, which ultimately measures the efficiency with which an economy converts inputs into outputs. 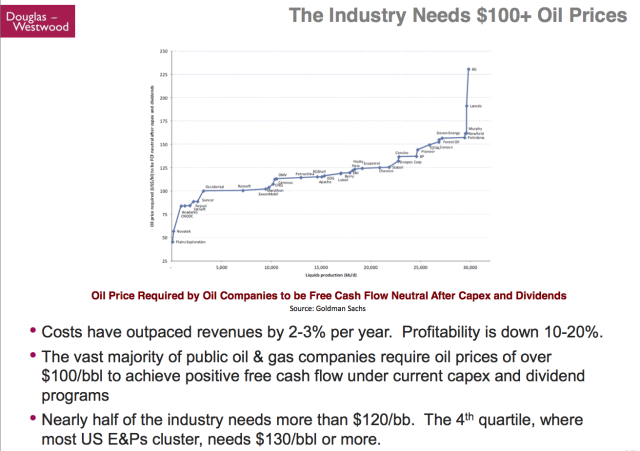 In the long run, total factor productivity is by far the most important driver of economic growth. We find that total factor productivity is the main channel through which workforce aging affects labor productivity. In particular, a five percentage point increase in the share of workers aged 55–64 is associated with a decrease in total factor productivity of somewhere between two and four percent. 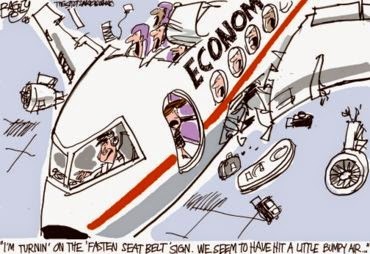 What does this imply for euro area countries? First, aging will take a considerable toll on productivity growth over the medium- to long-term. As shown in Chart 2, average total factor productivity growth in the euro area is forecast to be around 0.8 percent per year. This could be higher by a quarter—that is to say, total factor productivity could increase to about one percent per year—if we shut down the effect of workforce aging. This result stands in stark contrast to the United States, where the workforce is not projected to age at all (in fact, it is projected to become slightly younger), and hence the impact on total factor productivity is negligible. 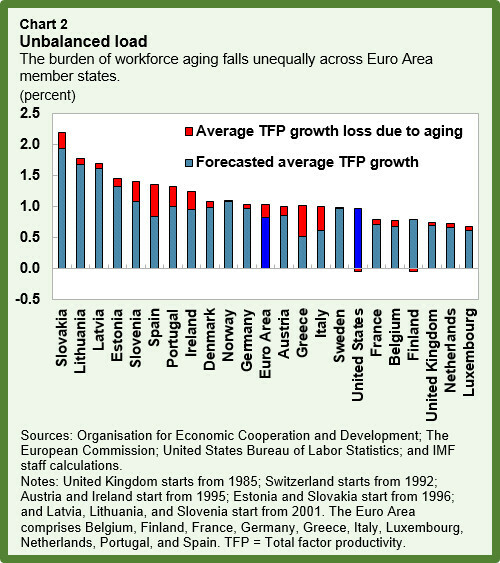 Second, the burden of workforce aging will fall unequally across euro area member states. Worryingly, some of the largest adverse effects on productivity will fall on countries that can least afford it, such as Greece, Spain, Portugal, and Italy. These countries already have elevated debt levels and meager fiscal space, and need rapid productivity growth to build competitiveness and bring down unemployment. The good news is that policy matters. 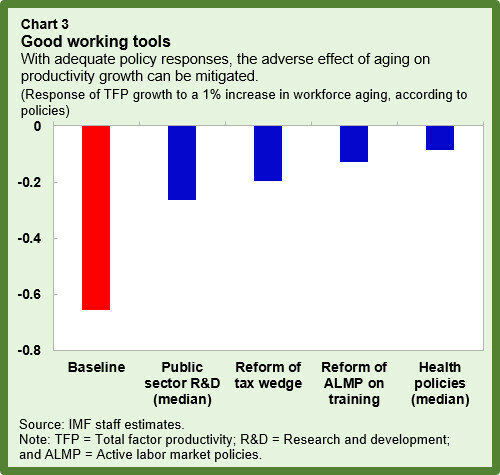 We find that a number of policies can mitigate the adverse impact of workforce aging on productivity growth (Chart 3). Health conditions—measured in our study by the availability of doctors—are particularly important. Sufficient improvements in this indicator have the potential to substantially reduce the negative effects of aging on productivity. While good quality healthcare is clearly beneficial to all age groups, older age groups are likely to use medical services to a greater extent, and thus will benefit disproportionately from public interventions to improve healthcare. Active labor market policies focused on worker training or re-training are another important avenue for mitigating the impact of aging. As with better health care, such training programs are likely to be disproportionately beneficial to senior workers, since their skills will typically lag behind evolving new technologies and job requirements. Other public policies—such as reducing the difference between gross income and after-tax income by cutting the rate of tax on marginal employment, and investing in research and development—can also help.